I just aquired a Gottlieb Black Hole pinball. When powered on, i get the famous Gottlieb system 80 power on "thunk", all play field lights come on, a couple seconds later all score displays come on and alternate back and forth from 000000 to last high score. It's at this point the ball gate cycles open then closed over and over(main play field) , while this is happening the lower play field relay cycles on and off over and over again. The start button does nothing, so im unable to play a game. Ive check all fuses, and checked all contacts in case something was stuck in the closed position. I've also checked all connections and re-seated just in case. At this point im not sure where to look next. Does any have any idea what could be wrong or suggestion of what else to check? Do you have credits in it? All three balls loaded into the trough? That's part of the attract mode. Not sure why the gate cycles, but that's how they coded it. Does the start button work in switch test? How about the trough switches? Before i try this, could you explain how to do switch test, i assume i press the little red button inside the coin door?.... Then what? Check your manual, page 13. Basically, hit the red button until you're on #18. Ok, i did the switch test and two numbers were shown 04 and 14. Machine doesn't recognize 3 balls in the trough. There are 2 switches in the trough, One switch should be covered by two balls and the second switch covered by one ball correct? When you run the switch test, the only numbers you should be seeing (once the drops have been reset) is 25 (third ball in trough). 15 is the outhole, make sure that's working so that it can kick balls into the trough. I did a switch test with all drop targets reset and the balls in trough as shown in photo, and the test read back swith 04. If you help the game pop the third ball into the trough, will the right coil then release a ball? I tried doing this and no, the right coil dosent release the ball when i try this. Does the left outhole kicker move freely if you turn it by hand? YES, it moves freely by hand. Do any of the coils work in coil test? .yes they work in self test, the left one is weak and the right dosent move, everything else works and appears strong. The right one is controlled by an external transistor mounted under the playfield. It's one of the ones that normally gives that 'thunk' on startup. Take a read through http://pinwiki.com/wiki/index.php?title=Gottlieb_System_80#Remote_Mounted_Transistors. Clean and check all board connectors. OK thanks, ill have a look at that and do some testing and report back. I DIDN'T mention that the right solenoid thunks on power up but nothing after that, i should have mentioned that, don't know if that changes your theory. .So im hoping when I trace the line from right solenoid back to connector / board ill find the problem for the right solenoid. What i don't understand is, the right solenoid not working causes you not to have a ball in the launch lane.... But the rest of the playfield should work after pressing the start button, correct ? Meaning if I touch a roll over switch or target or bumper with my finger they should all work right? 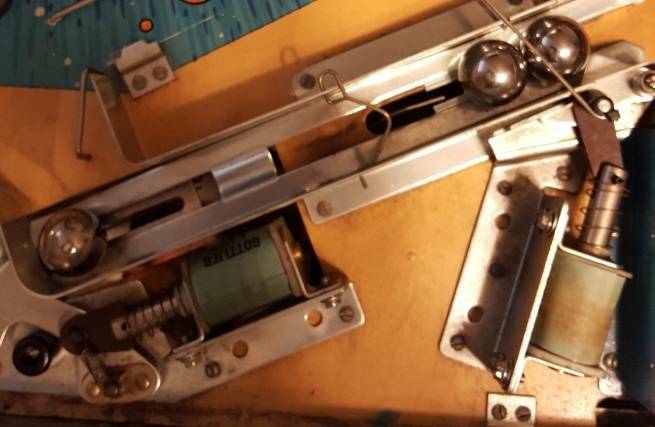 Well not only dose the ball not get delivered, nothing works on the playfield..... Is fixing the right solenoid going to bring everything back to life here? It might not energize till it sees there's not a ball in position three? Can't say for sure. If you fix that drop target switch, maybe you can verify that the 3rd ball switch is really registering in switch test. The rest of the playfield could be a completely different issue, or could be causing this issue. ok, made some progress, the reason why the left solenoid is weak and the right not working is because as soon as the start button is pressed the game tilts. i didn't notice this before but after reseating the sound board connection the game now says "Tilt, Tilt, tilt..." and the tilt light comes on the face of the game. this explains why the playfield is dead, i never noticed this before because there was not audible clue, and I didn't think to check for tilt light with door open. anyway, i have inspected the tilt switches and visually everything seems to be ok, so im not sure why its tilting right off the bat. The tilt ball has been removed, the tilt plumb is all the way down and miles away from the ring, and the slam switches are closed. what else could make the game think its tilted.? i have inspected all connectors and reseated each. well, for the heck of it, i reseated comnectors again.... and yes! it works! soooo happy. everything seems to work ok except one pop bumper is dead. but other than that its good. Want to thank everyone for all their time and help. Thank you so much! 1) Pin powers up, waits five seconds, enters attract mode (ball gate clicking, score flashes from 0 to 300,000). Display 4 does not display. 2a) Pushing the the "credit" button causes the game to "hang" and cycle a solenoid on the lower playfield repeatedly. Nothing else works (flippers etc). Game must be restarted. 2b) Pushing the self/test button does nothing as best as I can tell.